I just came across this fascinating chart by T. Grashop. 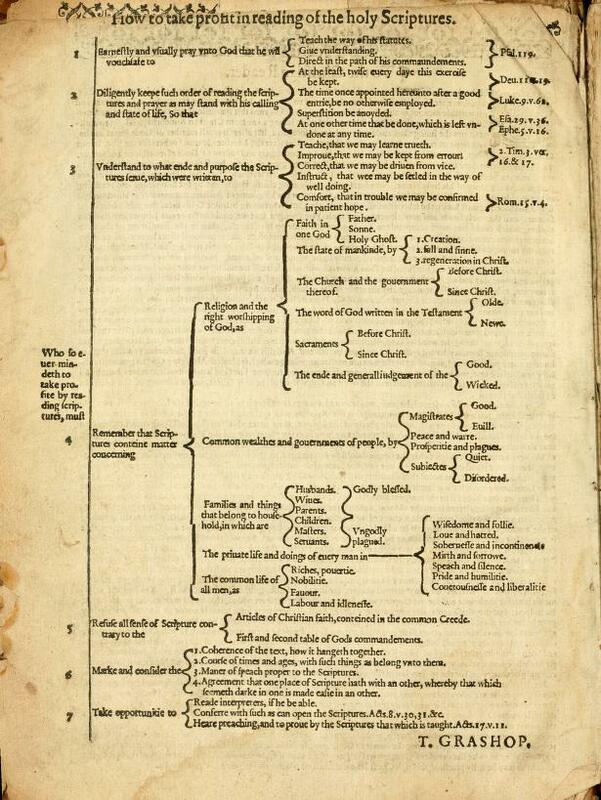 It’s printed in the front of the Geneva Bible, and it diagrams, using a tree of subdivisions, the way to read the Bible. There are seven steps, and they start as far back as “earnestly…pray unto God” that he will teach you, give you understanding, and direct you in his word. The second step is establishing good order in your reading, so that you read Scripture twice each day, that you focus on the reading without distraction, and that “superstition be avoided.” I’m not sure why the warning against superstition falls under this heading. The third step is to grasp the end for which Scripture was written, which can mostly be gathered from 2 Tim 3:16-17. The fourth step takes up the most space on the page. It exhorts anyone who would profit from Bible reading to “remember that Scripture contains matter concerning a list of subject: Religion, government, families, the private life, and common life. Under the heading of “Religion,” Grashop inserts a bare-bones systematic theology, from the Trinity to the final judgment. It’s interesting to think of this fourth step as crucial for Bible reading. Grashop seems to be indicating that we need to have accurate expectations of the kind of content that we will meet with in Scripture, and that these expectations ought to be established in our minds in advance. 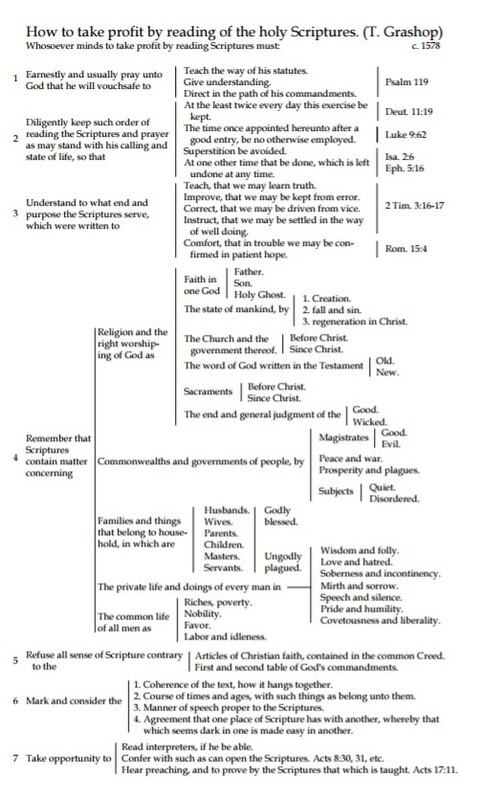 The fifth step is to “refuse all sense of Scripture contrary to the Articles of Christian faith, contained in the common Creed, and to the first and second table of God’s commandments.” The kind of Bible reading Grashop directs us to, in other words, is a ruled reading: the Creed and the Ten Commandments establish what kind of interpretations will be profitable. Mark and consider the coherence of the text, how it hangs together; the course of times and ages; the manner of speech proper to the Scriptures; and the agreement of various parts of Scripture with each other. Finally, the seventh point is an encouragement to read commentaries if possible, to confer with teachers, and to listen to Biblical preaching. It’s a good list, and the chart layout, aside from being nifty, leads the mind to work down through them in an expansive way. Here is a cleaned-up version of the diagram. Both Christopher Hill and Patrick Collinson have written about this chart, and neither of them can say much about who Grashop was. Perhaps somebody has figured that out in recent years, but once I saw that a serious historian like Collinson contineud to say that Grashop was “a shadowy figure,” I gave up on trying to identify him. I just like his chart.